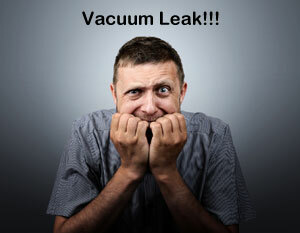 Leaks pose biggest challenge to engineers handling vacuum systems. Leakages cripple the work and are invariably time consuming to detect. This blog post is about two major issues related to leakage – Detection and Prevention. Physical Verification: – This should be used if even roughing vacuum (1 x 10-1 Torr) cannot be reached in the vacuum system. In this method the person has to move around the vacuum system slowly, paying attention to any hissing or whistling sound. This sound indicates location of leak.Though method is very simple, in this method experience of the person is very important and this way of leakage detection is suitable only for detecting large leaks. If vacuum climbs above roughing stage then obviously the leakage is small. For such leaks this method is used. In this method vacuum pumps are allowed to operate to reach a stable vacuum level. 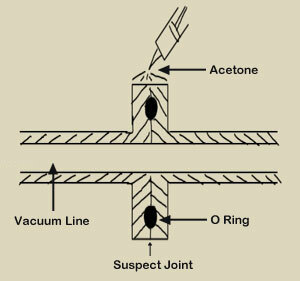 At this point a solvent, normally acetone, is sprayed (generally with a syringe) at the suspect joint. Since system is under vacuum if a leak exists at that joint then solvent is quickly drawn in. As we understand pirani gauge is very sensitive to change of gas compositions. Pirani gauge attached with the system therefore quickly picks up presence of solvent and its reading changes (vacuum drop). After a while the reading returns to the previous reading as solvent has been sucked away by vacuum pumps. If there is no change in reading of Pirani gauge then next suspect joint is tried and so on till leakage is detected. This is a very inexpensive method as it requires no special equipment. Expertise is however required for proper results. 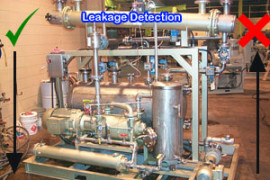 Helium Leak Detector: – Though expensive this is by far the most accurate of leakage detection methods. 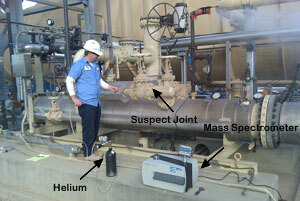 In this method a helium leak detector is employed. Using a bottle of Helium gas, Helium is squirted at the suspect joint by a nozzle. Since system is under vacuum, if a leak exists then helium is quickly drawn into vacuum system. After this a spectrometer is used to detect helium. (c) A detector to detect the composition of gas. The spectrometer is connected to vacuum line from which vacuum pumps are drawing away the air. Since spectrometer has an excellent sensitivity, by using the spectrometer, even minutest of leakages can be detected. If spectrometer does not detect any helium, then next suspect joint is tried, and by hit and trial, the leakage is identified. Since Helium is a light gas care needs to be exercised during leak detection to move from top to bottom of vacuum system and not the other way round. This is because Helium squirted at a lower joint can always quickly travel up and enter system from an upper leaking joint. This can absolutely sabotage the procedure. As the saying goes “prevention is better than the cure”. It is better if we are able to prevent leakage in the first place. 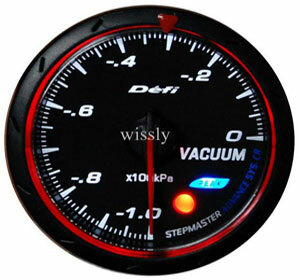 Many times faulty gauges result in assumption of a leak. Since gauges are highly sensitive equipment hence maintaining these properly is very important. This will prevent any false alarms and wastage of precious production time in hunting a leak. Virtual Leak: – Many times the design of system is such that from some part air is not able to escape freely. This results in pressure differential within vacuum chamber. For example, vacuum chamber may have been pumped down to 1 x 10-5 Torr but a part of chamber from which free escape of air is not possible may have vacuum of only 1 x 10-2 Torr. Slowly when the vacuum will be equalized in the chamber, then this will show as a vacuum drop, resulting in time wastage on leak hunting. To prevent this, proper system design is important and if such a pocket exists in chamber from which free flow of air is not possible then that part must be given more openings for faster evacuation. Water Vapour: – As vacuum engineers know, water vapor is most difficult to be pumped out. Because of the polar nature of water molecules, they stick to the walls of system forming strongly attached multiple layers. With time water vapor will be released from walls and cause vacuum drop. To take care of this, cryo panels are used in vacuum systems to freeze water vapor. Another way is to push inert gas in vacuum system at high speed. This dislodges water molecules and with inert gas these water molecules are also drawn away by vacuum pumps. Argon and helium are cheaper in the list of inert gasses and are therefore commonly used for this purpose. One could however use any other inert gas also like Neon, Xenon, Krypton or Radon. Since metal to metal surface contact is unable to hold vacuum so O rings are employed to seal vacuum. Using good quality Viton O rings with good compressibility solves problems of leakage to a large extent. 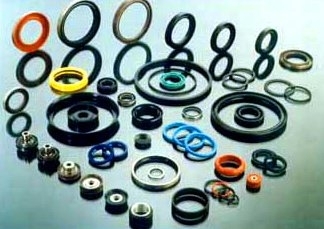 Another precaution is to discard O rings if they harden, soften too much or swell up. Good quality Vacuum grease applied to O rings goes a long way in preventing leakages. This is because not only does it provide additional vacuum sealing but also protects the O rings from hardening and damage. This grease should have a very low vapour pressure and excellent tackiness. 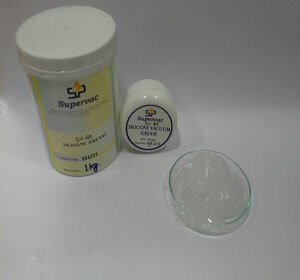 Supervac manufactures High Vacuum Silicone Grease SV-G9 which is widely used by vacuum industry all over the world. Baking:-If Possible the vacuum system should be baked at a temperature of 250o C for minimum 12 hours under vacuum from time to time. This expels the volatile gasses attached to vacuum system walls. Leakage in a vacuum system is a nightmare, but observing a few basic precautions like proper care of pumps, replacement of O rings as they age, application of Vacuum grease and cleaning of flange surfaces etc. go a long way in containing the problem. If a leakage occurs then immediate action to detect it before it snowballs into a major problem is important. Also people performing leakage detection should be adequately trained and given required tools to be able to solve the problem quickly and save precious production time.